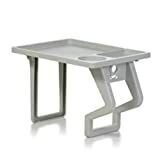 After a thorough examination of several hot tub tables, we’ve found that the Best Spa Side Table is the Leisure Concepts Spa Caddy Side Table. This table must be fastened to the wooden frame for your spa, and is not for inflatable hot tubs. The table top is a little bit bigger than most competitors and can be swiveled to one side for when it’s time to close the cover. Since it is supported by a permanent bracket, properly installed it is capable of supporting a greater load and is far less likely to dump your drink, chips, and your cellphone into the water. For more information on the Leisure Concepts, see the Product Reviews section below. Our runner-up best hot tub table is the QCA Spas 6952BL Aqua Spa Snack Tray. It has only one cup holder, and it isn’t the cheapest table available. But it fits almost any spa without screws and is attached by using a sort of clamp to hold it in place. It offers a stable, level surface that can hold items such as a cell phone, your drink or a snack. It has the added advantage of not requiring a wood frame for installation. By having two or more of these available, they can easily be installed in locations that are most conducive to your enjoyment and that of a guest. 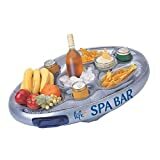 For more information on the Aqua Spa Snack Tray, see the Product Reviews section below. If you’ve got an inflatable hot tub, check out the Intex PureSpa Cup Holder. It isn’t the largest, the most expensive or even the most impressive. Made for wide walled or inflatable spas, it simply drapes over the wall. It does have a couple of small drawbacks. It doesn’t fit on spas that have narrow walls, and it isn’t very big. It is made to hold cans or bottles and won’t readily accept other sorts of beverage containers. It is perfect, however, for your inflatable spa. No clamps, no hardware, no screws, and no need for a wooden wall for support. Like the runner-up, if two or more of these handy little holders are made available, you’ll have plenty of space for anyone using the spa. For further details on the PureSpa Cup Holder, see the Product Reviews section below. Sometimes a cool drink can be a perfect accompaniment to a session in the hot tub or your hot tub party. Bubbly goes extremely well with bubbles, as they say. Well, as we say, anyway! (Ok, technically you should be cautious when drinking alcohol in a hot tub, but we couldn’t resist the pun). Here are a few aspects of spa tables to keep in mind to help you find the right table for your needs. This is the most significant consideration when choosing a spa table. How will the spa table attach? Some tables are secured by getting screwed into the sidewall of the tub. Of course, this means permanent screw-holes in the sidewall, and it also means that the side table cannot be moved to a different location without making new screw-holes in the sidewall. Screw-in tables are likely the sturdiest tables, however. Some tables use a clamp system for security onto the wall of the tub. These clamps generally rest on each side of the spa wall, and are cranked to the point where they grip solidly. Clamp-tables are fairly sturdy, and they don’t require holes to be drilled into the spa walls, which is a huge benefit. However, they often will need to be removed before the spa is covered, which means taking the table on, off, on, off every time it’s covered. This may be a hassle, but it also means these are pretty easy to move where needed. Some tables simply rest on top of the spa, with feet that go down on each side for stability. These are typically ideal for inflatable hot tubs. but are not very strong, and are not capable of handling much weight. If you have an inflatable hot tub, you’re generally stuck with these, or perhaps with a clamp on table clamped on extremely gently. Floating tables don’t mount to anything, they simply float around, holding your drinks. Of course, any jostling, bumping, or carelessness when using the table can cause it to topple over, spilling whatever foods and drinks you have into the spa. Gross. Be very careful with these tables. Buyers should also consider the size of the table, and whether or not there are any features like cup holders that help balance cups and cans on the table. Some side tables can be easily moved to different areas and positions, while others are fairly fixed and cannot be moved. Consider how frequently you expect to move your side table. Screw-in side tables are clearly more difficult to install than clamp-on or surface-mount spa tables but are sturdier and more capable of supporting reasonable weight without toppling over. Also, you want to make sure that the installed location is out of the way of any spa cover lifts or other spa cover storage mechanisms. By protecting snacks with watertight containers and focusing on drink containers that are likely to float rather than sink, you’ll decrease the likelihood of the food getting into the spa. Use common sense, and especially when using inflatable tables, be very cautious with your foods and drinks. You shouldn’t be putting your phone on a spa table. Just put your phone away during your time in the hot tub, and enjoy the experience without distraction. Seriously. Don’t drop your phone into the spa, and don’t get your phone all wet and ruined by putting it on the spa table. Spa side tables are a great solution for those who want to drink or eat while in the spa. Please be careful with food and drink in the spa, as no one wants a Cheeto-dust haze on the top of the spa. Choose foods that are fairly clean to eat, and use plastic glasses for drinks to ensure no broken glass in the spa..
With that said, there are several different ways to have a drink tray or table available for your use. Some trays fasten to the spa body, some simply hand over the rail, while others are inflatable and can be taken out into the middle of the pool. In this section, we’ll look closely five of our favorite spa tables. We’ll start with a comparison table to get the lay of the land, and then move into the individual products. We’ll conclude with our favorites. Made of molded plastic, the AquaTray Spa Table is a small pool or spa side table that will not be bothered by moisture. The unique leg shape helps to hold the table in place. While not large enough for a meal or extensive snacks, it can hold several small items so they are nearby while you relax. Cup-holders are included for convenience, and for additional balance. The blue/gray color is unobtrusive and will blend with most pool colorations. This is a nice table that functions as designed, and it does not require assembly. It will fit a variety of pools or spas, especially those with a wide ledge. It is even usable with inflatable pools. The AquaTray is not a bad choice, though it’s a bit on the pricey side based on its functionality. The swivel top is designed to allow users to easily move the table out of the way of the spa cover. The top and the post can easily be removed when it’s time to cover the hot tub. The mounting bracket is permanently placed. This design makes placing the cover, cleaning the spa tank and maintaining the spa easy. The neutral granite coloring blends well with almost any spa décor, and this table certainly looks attractive. This is an excellent choice for almost any stationary spa that has a wide, protective wall onto which the post can be mounted. The table is sturdy and high quality. 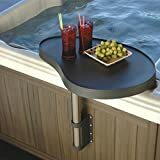 For anyone who is ok with permanently mounting their spa table, this is the best choice. Just be sure you know where you want the table to go before you install it, as there’s really no going back once you screw into the spa side wall. Swings in or out of the spa. Made of reinforced, weather-resistant plastic. Equipped with a stainless steel upright post. Mounts on virtually any spa. The PureSpa side tray is a simple, useful side table designed to work primarily with inflatable hot tubs like the Intex Pure Spas and Lay Z Spa hot tubs. While it will likely work with other hot tubs, it is most appropriately used with an inflatable. With nothing to assemble or attach, this portable cup holder is an easy way to keep your drinks or snacks close at hand while you enjoy your spa. The plain, tan color will easily blend with most décors, and the plastic surface is easy to wipe clean. While perhaps not as secure as a cup holder that is attached to the pool, the PureSpa table can be easily set up, cleaned and stored. It doesn’t require any added hardware and can be moved from one location to another. If you need an inexpensive cup holder that can be moved from one place to another, this is certainly it. More than that, it can also be used to drape over the transmission hump in some vehicles to provide added cup holders or storage space. Great for pool parties or just for lounging without interruption, the Life Spa Floating Table inflatable spa table will work with any spa. Nothing to attach, it only needs to be inflated to be ready to go. Users need to be particularly cautious with this table, as it’s pretty easy to topple it over if there are a lot of people in the spa, or if the bubbles and jets are running too strongly. Or, of course, if someone simply bumps it the wrong way! And of course, like all inflatables, there is always the chance for a leak, so watch out for that as well. Should a leak occur, there is a patch kit included. While not wishing to be alarmist, where there is inflation there is a chance for deflation. However, if snacks and drinks are in watertight containers, or if you are willing to accept the risk, this can be a fun addition to any pool party. While not as sturdy as some of the other trays or tables, this inflatable table has the advantages of being easy to set up and having plenty of room. With eight places to put drinks or snacks, you won’t have any trouble loading it up with supplies. Watertight containers that will float can help prevent sad disasters that could result from unexpected deflation or from overly boisterous guests. This is not our top choice, but for some users who will treat it with caution, the Life Spa Table will work well. The QCA Spas Aqua Spa Snack Tray is a pretty similar design to the AquaTray above, with a few tweaks. While it is not extra fancy, this basic black spa side table can easily hold your drinks and snacks. It is not overly large, but is not the smallest of the tables, either. It does not require screws or bolts to mount but can simply be placed over the edge of the spa and held in place by means of a clamp. More than that, this utilitarian table can be used on the sides of chairs or even attached to a vehicle door if the window is rolled down. It’s possible this tray could work in some inflatable hot tubs; it doesn’t use screws or anything. However, it probably won’t work with all inflatables, so we’ve marked it as a NO in the comparison chart. If you are looking for plain functionality, the Aqua Spa Snack Tray might be just the ticket. It is easy to set up, easy to use, and is not likely to deflate halfway through your party. It can be used not only on the sides of a spa, but also clamped to any stable location, such as an open window, a chair arm or a porch railing. We were impressed with its versatility as well as its minimal cost. After thoroughly examining several different types of spa tables, we feel that the Leisure Concepts Spa Caddy Side Table is the best spa table around. It’s attractive, sturdy, and more robust than the other choices on our list. However, the obvious downside is that it must be permanently screwed into the side of the hot tub: something many will not want to do. It also can’t be relocated once it’s installed. The runner-up selection, the QCA Spas Aqua Spa Snack Tray was chosen because it clamps into place and can be used on most spas without requiring tools to mount. It must be removed to add the spa cover, which is a minor pain. But it does not require a permanent mount and can be easily used in other locations, including porch railings or open windows. For those looking for inflatable hot tub tables, the Intex PureSpa Cup Holder is an obvious choice. It’s very easy to set up, and works well enough, especially given its price. It will also work on ordinary spas that have a wide rim but does not do as well on those that are narrow. It can also be used in vehicles that have that central transmission hump to add cup holders and a convenient central utility holder. Spa tables can be useful and can make spending time in the hot tub more enjoyable. Just use common sense with these tables, and don’t put electronics on them. Use plastic glasses for beverages, and store food in resealable containers. This way, if the table topples, you won’t be fishing salsa out of your hot tub for months. And on that note, happy relaxing in your spa!